Last time we talked about choosing true bronze in order to get the look, feel, and functionality that we see in many pre-1600 pieces. But there is at least one metal that I generally avoid like the plague in my workshop – lead. Lead was widely used in many pre-1600 items (for that matter it wasn’t banned from house paint in the US until 1978). When we look at period examples of inexpensive jewelry, it is often made from lead, tin, or an alloy with lead. This example, of a lead cross pendant from Egypt, is typical of some of the less expensive jewelry that would have been made for ordinary people. Lead can also be used as a decorative element in jewelry, including niello and leaded enamels. Niello is a black substance that can be fused to the metal in a piece of jewelry to create a contrasting design. If you are interested in the details of how niello is made and used, please visit my blog on this topic. The Anglo Saxon’s were masters in the use of niello. The black stripe up the middle of this Anglo-Saxon brooch is niello (and so is a lot of the tracery on the Sutton Hoo pieces). Prior to 1990, Thompson Enamel, which produces a considerable percentage of the enamels used by both artists and industry, contained lead. Many companies still make leaded enamels. And it is safe to say that most enamels that were used before 1600’s would have contained lead. Lead makes the enamels very stable and gives them good flow properties. For more information on enamels, here is the link to one of my blogs on enamels and how they were used (I mentioned it last week, too). And yes, I do sometimes use leaded enamels. Lead, being a naturally heavy substance, was also used for many practical purposes like this steelyard weight. The Bronze weight was cast as a hollow piece and then filled with lead until it was the desired weight. Spindle whorls are another excellent example of an item was very frequently cast in lead. 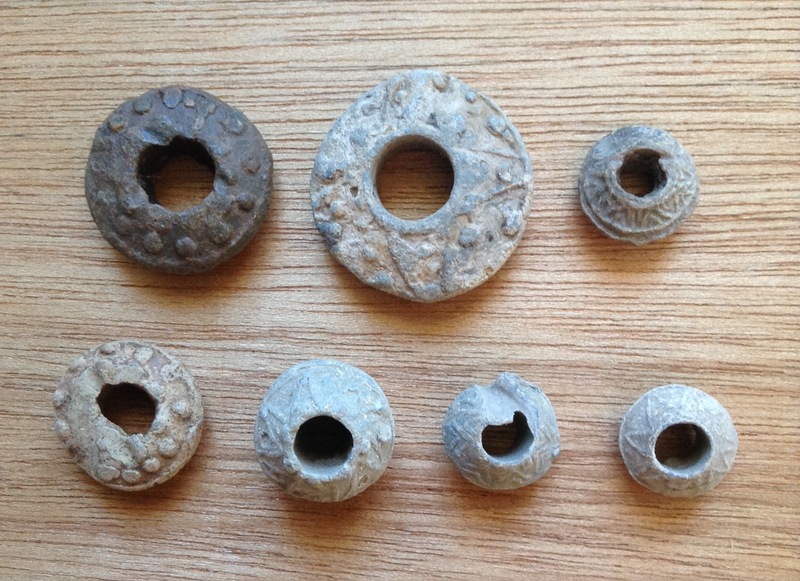 I own several lead spindle whorls, all of which were found in England. Lead, being a rather soft metal, is relatively easy to damage. Two of the spindle whorls in the bottom row of this picture are excellent examples of this. The far left whorl has been compressed slightly, and the spindle whorl that is the second from the right shows a significant gouge, probably from a plow. Lead can certainly be used and worked in a safe manner, but legally there are a lot of issues. Every state has different rules about how much lead is legally permissible in jewelry, especially in jewelry that may be used by children. When I first started making jewelry I sat down to read all of the different regulations for the states that I was planning to merchant in. It didn’t take me long to decide that it was simply easier to avoid it. Whenever pewter or lead is called for in jewelry or other accessories, like spindle whorls, I simply use a good quality unleaded pewter from a reputable supplier. Next Time: Are there any other issues with metal that should be considered? This entry was posted in Archaeological Finds, Jewelry, Metal Casting, Metal Working and tagged bronze casting, casting lead, lead in enamel, lead in jewelry, lead in niello, Metal casting, niello by Eirny. Bookmark the permalink.